Inflated Tips: Spring to early summer. Nibbled raw, stir-fried, simmered in soups and spaghetti sauces as thickening agent, or added to quiche and omelettes. Tender ends of fronds: Spring to early summer. Fertilizer: The British use potash-rich Fucus as fertilizer for potatoes and broccoli. Spreading it directly on fields as a mulch, and plowing under when desired, is the generally recommended procedure. 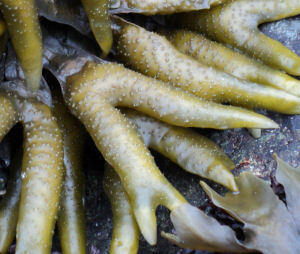 Ashes of the burned seaweeds are commonly used as a garden supplement. Blend ingredients and store in airtight container in dark closet. Steep 1 heaping teaspoon herb in I cup boiled water for 5 to 10 minutes. 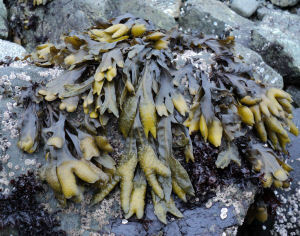 NOTE: Except for bladderwrack, all of the above herbs should be dried in shade. [E-flora] 2017. E-Flora BC: Electronic Atlas of the Plants of British Columbia [eflora.bc.ca]. Lab for Advanced Spatial Analysis, Department of Geography, University of British Columbia, Vancouver.